To stay slim you need to keep up with your beauty sleep. Between 6.5 and 8.5 hours of it in fact, according to researchers at Brigham Young University. The researchers discovered that people who regularly slept for this long every night had lower body fat percentages than those who had irregular sleeping patterns. Don't worry, we aren't going to have you standing on your head to eat meals. This tip comes from 'Biggest Loser' expert Devin Alexander. Whenever you need to season food, season the bottom of it instead of the top - for example, buttering the bottom of a slice of toast. When you bite into the food, the flavour will instantly hit your tongue, and you'll need less seasoning or butter to get the taste you want. One of the best ways to speed up your slimming journey is to keep a daily food diary. Note down what you eat, when you ate it, and a rough calorie count for every day. Participants in a study at the Kaiser Permanente Center for Health Research who kept a daily food diary lost twice as much weight as the participants who didn't keep any record of their eating habits. 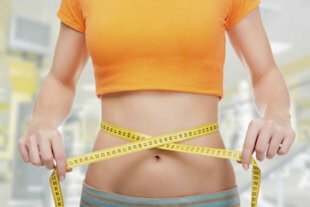 If you're working out in the gym in your attempts to slim, then you should start measuring your waist rather than your weight to track your progress. Whilst body fat can fluctuate depending on muscle mass, your waist size won't lie, and will act as accurate proof that your efforts are paying off. This daily slimming tip comes with the added bonus of minty fresh breath. According to speakers at an American Dental Association, brushing your teeth after every meal can help with weight loss. Brushing your teeth acts as a subliminal signal to your brain that it's time to stop eating, which prevents any sneaky post-meal snacking. The next time you sit down for a meal, turn your TV off, hide your phone, and focus your attention on your food. A study at the University of Bristol made the shocking discovery that distracted people eat up to twice as much as people who enjoy their food at a table with no distractions. If you regularly face a busy work day, you'll no doubt be used to wolfing down your food in five seconds flat in a bid to get your lunch out of the way as quickly as possible. Whilst this may boost your working life, it'll also expand your waistline. Researchers in Japan observed that women who ate more slowly also felt full much more quickly, and ate few calories overall. If your diet doesn't contain enough fibre, then you'll struggle to stay slim. Fibre keeps you full for longer, and ensures you don't snack between meals. It also helps to cut back on the calories your body absorbs - in one study; women who doubled their fibre intake absorbed 90 less calories every day. From time to time your body will crave something less than healthy, and you need to listen to it. But not in the way you might think. With nutritious substitutes, you can obey any craving without stalling your slimming mission. For example, if you want something sweet, reach for the fresh fruit instead of sugary snacks. If you give in to temptation and eat a packet of crisps or a chocolate bar, your brain automatically assumes that eating everything the packaging contains counts as one portion. Instead, separate your food from its packaging and you'll find you eat much less. For example, instead of stuffing a chocolate bar into your bag, break off a couple of squares and put them in a container to be enjoyed as a sweet treat in the afternoon. Adding a slice or two of lemon to your water gives you much more than a bit of extra zing. Not only will the added flavour encourage you to drink more water, but lemons also contain a whole host of healthy extras like vitamin C, vitamin B, and potassium. The citric acid it contains will also help to flush our your system, leaving you feeling cleansed and energised.